This week was another busy one. I'm not sharing a lot this week, because I want to leave the suspense for the big reveal next week! If you remember the original plan, I planned on adding some fabric to the white panels on the bed to tie in the window shades, and add some color to her bed. I purchased some additional fabric from Tonic Living, and then headed to Home Depot to have them cut some thin sheets of luan plywood to size. I laid out the panels on top of the fabric to strategically place which flowers I wanted to showcase. Ha! I love this picture. Someone's excited to move back into her room and all her stuffed friends are watching me. It is a constant struggle keeping her out of her space while I'm working in here! The panels were SO easy to add. I just wrapped and stapled the fabric to the plywood, and then positioned them in each opening. The end ones fit so tight I didn't need to do anything else. The long piece was long enough that I wanted to make sure it was secured properly. I just bought some industrial strength, 2" vinyl strips and adhered them to the back. I will show you the finished bed next week on reveal day! Another before pic of what the bed looked like without the fabric panels. 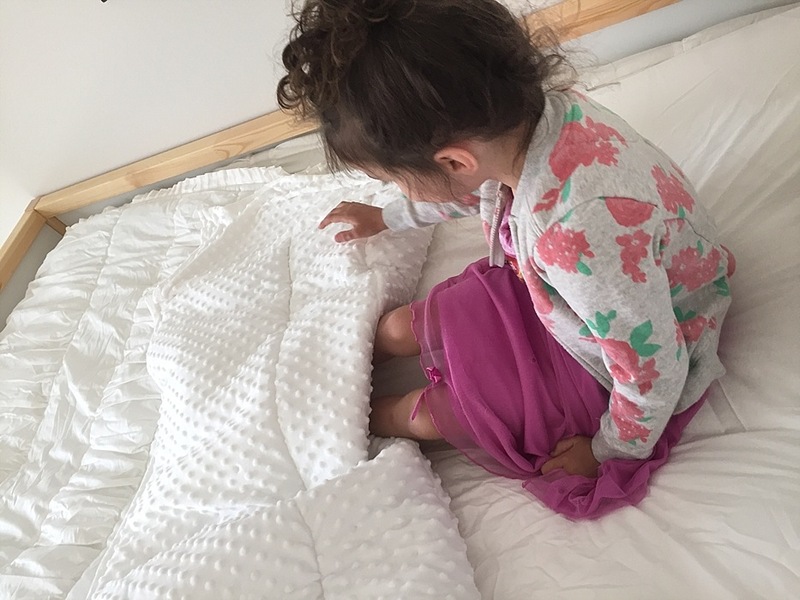 We got to make her bed this week with the bedding that Beddy's sent me. I was SO excited to partner with this company. I have always wanted to try their bedding, and this was the perfect space to use it in. Have you ever heard of them? You literally zip your bed up to make it every morning. 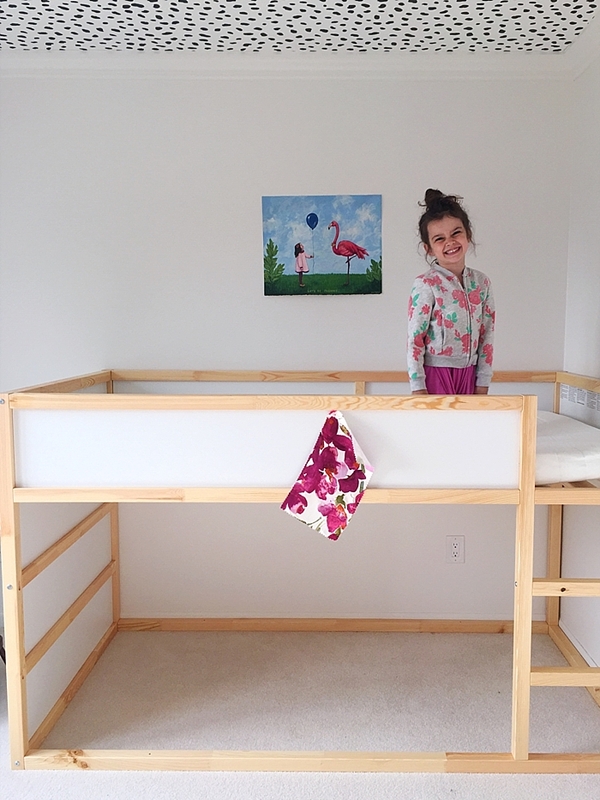 Their slogan is, "kids can make, zip their own bed." It's almost like a sleeping bag for your mattress, and there is the SOFTEST blanket that is sewn into the inside. Trust me, if you are in the market for bedding, you will NOT be disappointed with this! I ordered the Chic White which is simply beautiful. The ruffles, the texture, the color, and the quality is absolute perfection. Their service was so prompt too. From the time my order was placed, to the time that it was delivered, was a little less than a week! I am LOVING how this room is coming together, and so is she! I will leave you with this last sneak peek. If you follow me on Instagram, you may catch a glimpse of a few more peeks into her space before the final reveal. Good luck to my fellow participants as you finish your spaces! I can't wait to see the full reveals of some amazing spaces I've been following along. I am grateful for the companies who trusted my vision for this space and partnered with me on this room! Just swooning over this space! Coming back week after week has been so fun...I'll be sad when it ends next week, but I'm so excited to see your finished space! 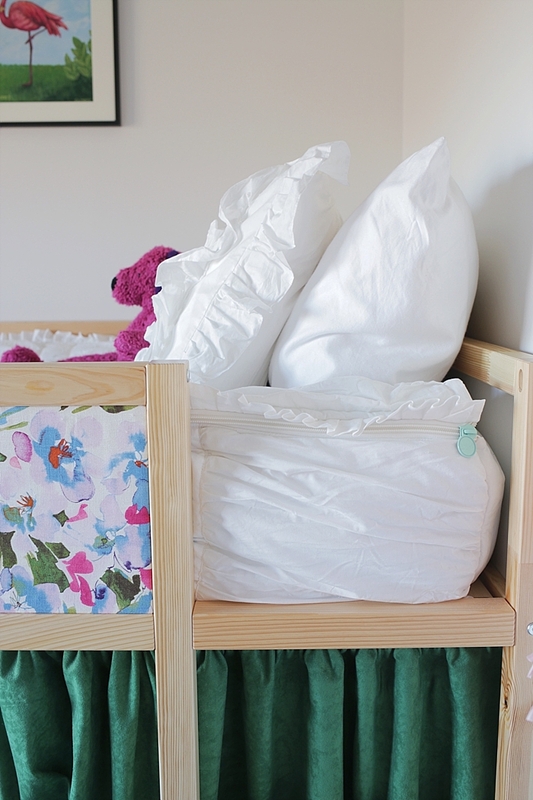 That zip up bedding is just about the smartest idea ever! Oh my, love all that color and can't wait for the big picture! Right Jennifer? It is really brilliant! Thanks for coming over and checking things out! I am SO excited for this reveal!!! I love the colors, patterns, and textures you have going on! Thanks for the intro to Beddy's too! Thanks Carol! I am so excited to reveal it! It is officially done! I'm just finishing up photographing her space so she can move in! Excited to see your reveal as well! Oh my goodness what a major transformation you've done already! How cute and pretty is this bunk bed?! Some serious DIY skills, kudos! Can't wait to see this room on reveal day; let's do this! Thank you Laura! I apologize, but I am so far behind on life, I haven't had much extra time. I missed the link up yesterday, but will look at it for the final reveal! Thanks again for stoping by and for your kind words!!! Whoa....that bedding is genius! Like really, really smart. And I'm dying- can you just reveal already?!?! I can't wait until next Thursday to see this space!! haha! You are too funny! I know... it's so hard to wait on these projects. I am the person who hates surprises, so it's hard to have the room done and not reveal it! The bedding really is genius. Clearly it was women who came up with the idea!!! Those panels... what a smart idea... and your daughter looks so happy. This room is turning out so cute. Thank you Mila!! 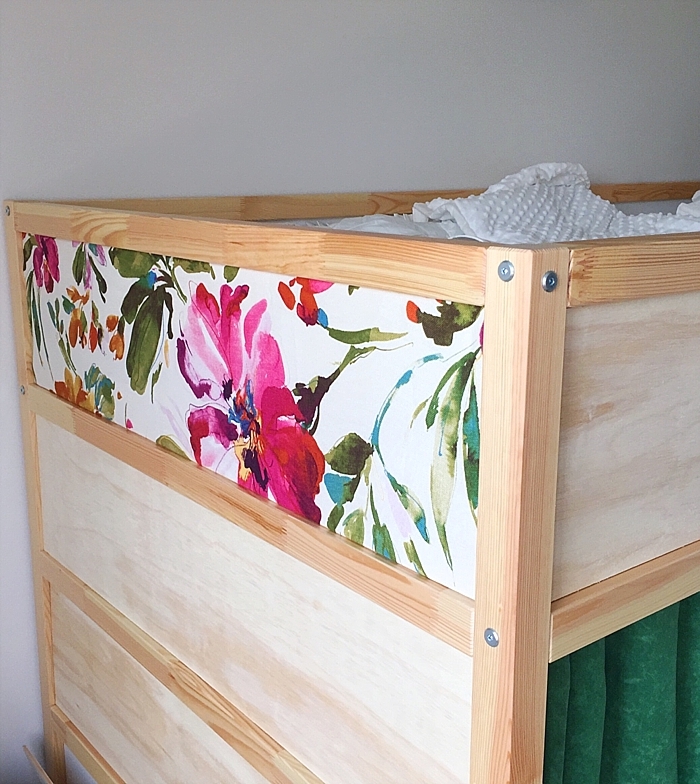 The bed needed a punch of color and it was SO easy to add some! Stephanie I just love the stuffed animals all lined up - your precious girl is SO excited about this makeover!!!!! That's the best!!! I totally love love love that Tonic Living fabric and what you did with it! Everything is looking so fantastic! Can't wait for next week! Attention grabing post of online dating and love it is so much informative have i ever gotten, you deserve the best thanks from me, thanks for sharing it here. I love this idea! I've been hesitant on getting my toddlers bunk beds. 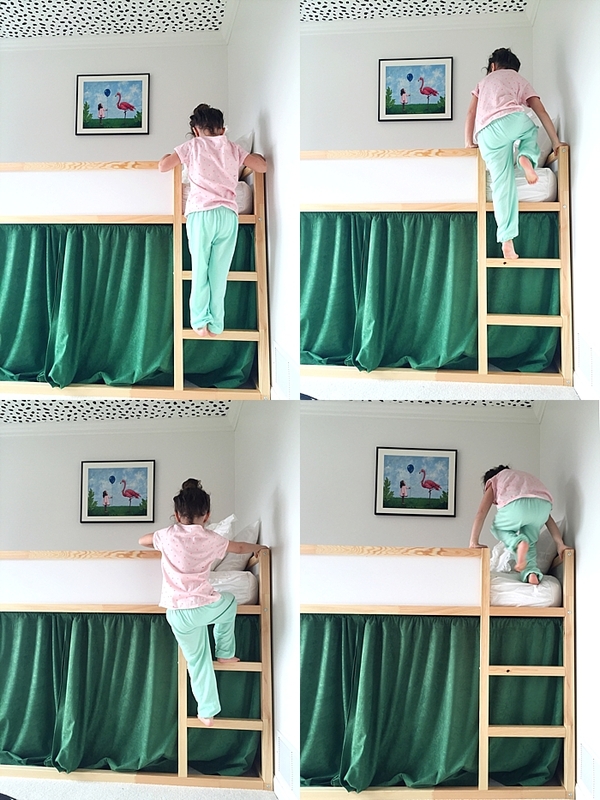 My husband and I have always loved Ikea's bunk bed for the kids since its perfect height. We are going to go buy it for them now that I seen your project. I can customize each of their beds to their own personality. I was wondering if you still know the sizes of the wood you bought at home depot. You definitely made this bed come to life! If you'd be able to share those sizes I'd appreciate it!!! Hi Glorify! 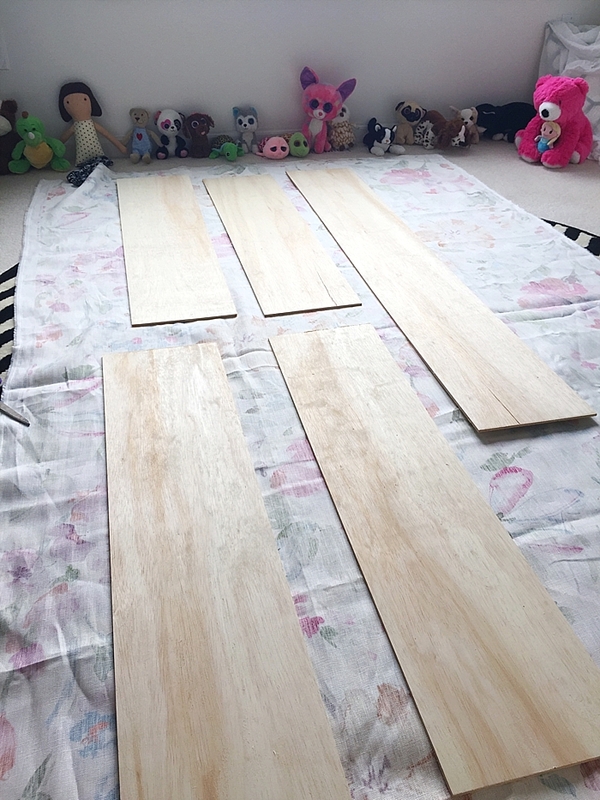 I can't recall the exact size that I used, but I purchased a Luan Plywood (higher quality flooring underlayment), but thinner than a plywood and had them cut the panels to the height and width of the side panels. I then had to take a hand sander and sand the edges down slightly to make them fit perfect fit before covering them with fabric. The 4 end panels fit so tight that I literally just had to place them in there once covered, but the larger front panel I used a commercial grade velcro to adhere it. Hope this helps! Good luck! Love this! How many yards of fabric did you need to cover all of the panels? I love this and have decided to copy the bed idea! I'm trying to figure out how you hung the under bed curtains though.. Thanks for posting! I'm super excited to get this finished! 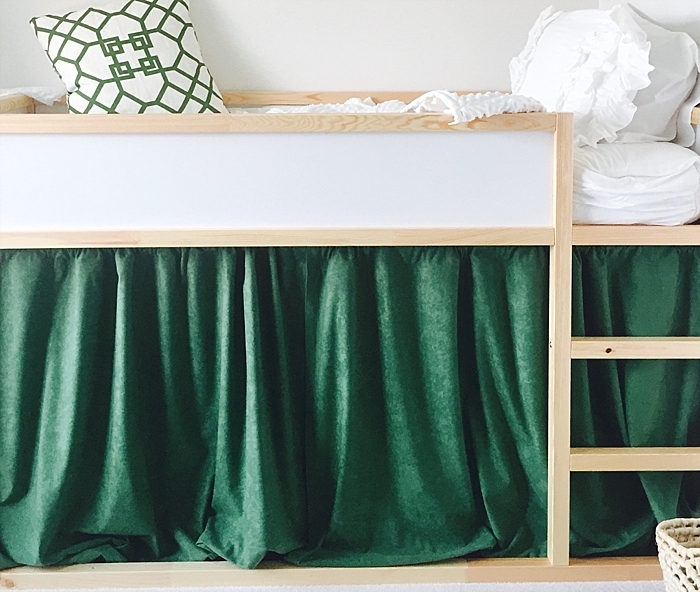 Love this - how did you hang the curtains under there and get the rod to stay up? Thanks!